Trini-born Stephen Phillip is not your average deejay. 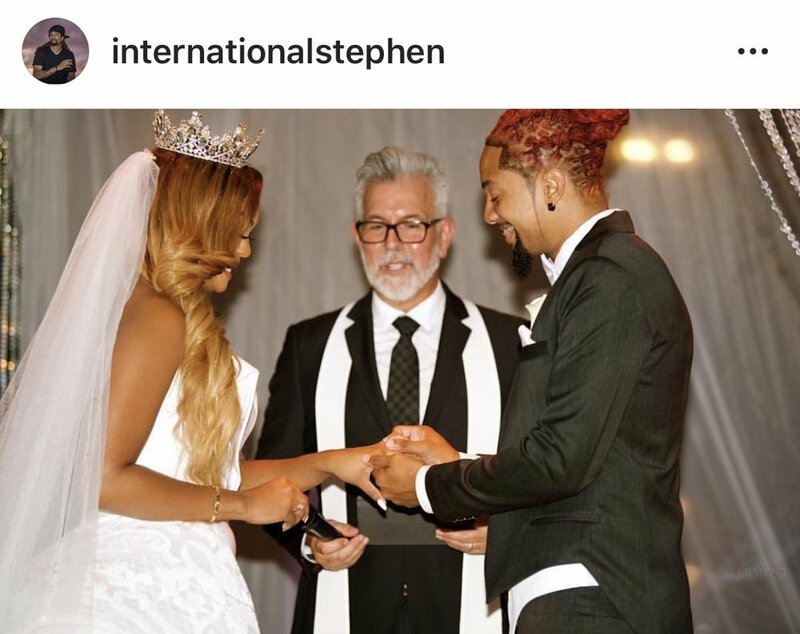 For years he was Machel Montano’s tour deejay, the man behind Atlanta Carnival and Ibiza Soca Festival, and worked on V’ghn’s “Trouble in the Morning” and Teddyson John’s “Vent.” Now DJ Stephen can add the title husband to his extensive list of achievements. Bronx rapper Cardi B. traveled to her mother’s homeland to perform alongside Bunji Garlin and Shenseea at Big Bad Soca in Trinidad. From her arrival in the airport, she was treated like a returning hometown hero. Fans turned out in droves on February 7th to see the former reality tv star perform her hits from her “Invasion of Privacy” album. Pictures of her in her skin-tight outfit worn that night circulated on the Internet, starting the pregnancy rumors. Although Cardi tried to quell the rumors, she revealed her ample baby bump just two months later on “Saturday Night Live.” Cardi B. gave birth to Kulture Kiari Cephus on July 10th, 2018. Usually I could take or leave Miami Carnival, but this year I really have to say I had a time! 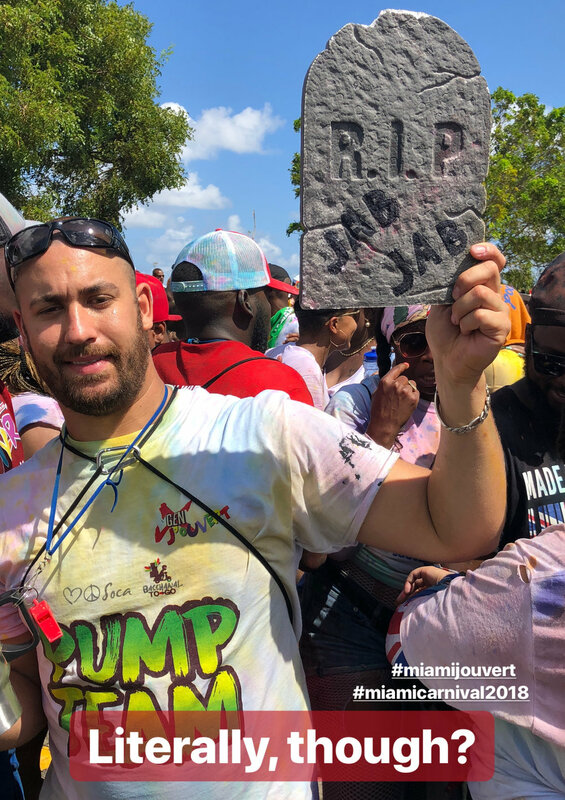 What stood out the most was the j’ouvert on Saturday morning. I played j’ouvert in the rain with Stanman of Small Island Massive’s band Jouvert Xpress. Yes, I played in Grenadian blogger SocaSaySo’s section, but as she knows, I can support and still critique. This truck had awesome deejays like Choice 1, DeeJBlaze, and Sonic Boom as well as live performances from Rudy Live, Scrappy, and Asa Banton. This was one of the few moments in 2018 when I heard music from Grenada, US Virgin Islands, Dominica, Antigua, Montserrat, Barbados, Trinidad, and pretty much everywhere EXCEPT Guyana. I am sure that will change for next time. I had a great time. My head was so bad, I didn’t realize I was being recorded wining on something. Ooops! Last year, I was not able to play mas in Toronto due to illness and I was vex. Damn human condition! I was determined not to miss it in 2018 and this time I encouraged SocaSaySo to play ah mas as well. Of course, we played with Dr. Jay’s section of Saldenah and I’m happy to say he did not disappoint. Our Venus Fly Trap costumes were amazing and the whole road was just a sea of bright colors. It was great to once again jump, wine, and dance down Lakeshore Boulevard. I’m surprised we had the stamina for this considering that we went to two j’ouvert parties the night before - Rejouvertnate and Jab Jab Jouvert. The weekend was also marred by an unfortunate turn of events that affected staple fetes. A “noise complaint” caused the City of Vaughn to revoke the permits for SOS Fest’s Carnival Kingdom party. The authorities were called and the event was shut down before it ever started. This also caused Dr. Jay’s highly-anticipated Big People Fete to be cancelled as it was to be held at the same venue. The controversy and speculations about the cause of the sudden cancellation cast a dark shadow on an otherwise spectacular Caribana weekend. Of course this takes the number one spot. Not only was I able to return to my parents’ home country, but I was there to witness their first Carnival! As with any new endeavor, it will take a while to promote and organize things, but Guyana is off to a strong start! Events were communicated through the Guyana Carnival Committee and there were plenty of parties. I was also able to get familiar with new music and the artistes who headlined the stage shows. I am so proud of what was accomplished and I am anxious to go back for round two in 2019! 2018 was filled with some great moments so I had to close it out with one more. I rang in the new year at Big Night New Orleans. The Hyatt Regency hosted thousands with four floors of open bar, gambling, live music, and a crowd that came to have a good time despite being decked out in suits and glittery dresses. What a night! Now to focus my attentions on more urgent matters, like what new adventures I’ll have in 2019.